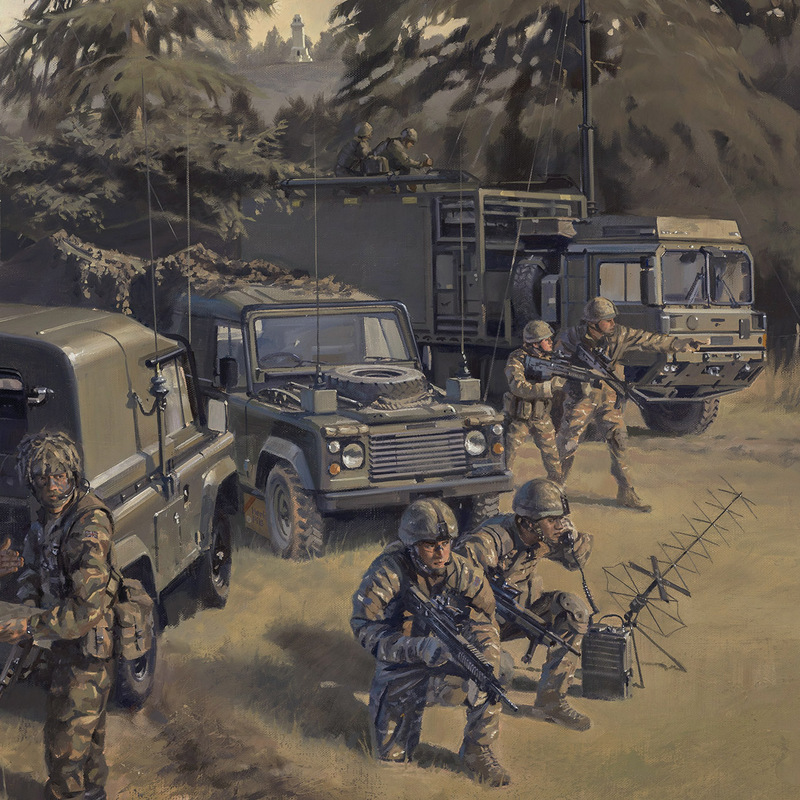 Commissioned by the Royal Corps of Signals in 2015 to mark the end of their long period of service in Germany. 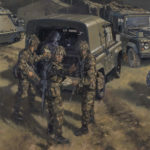 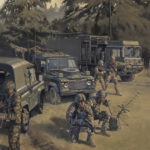 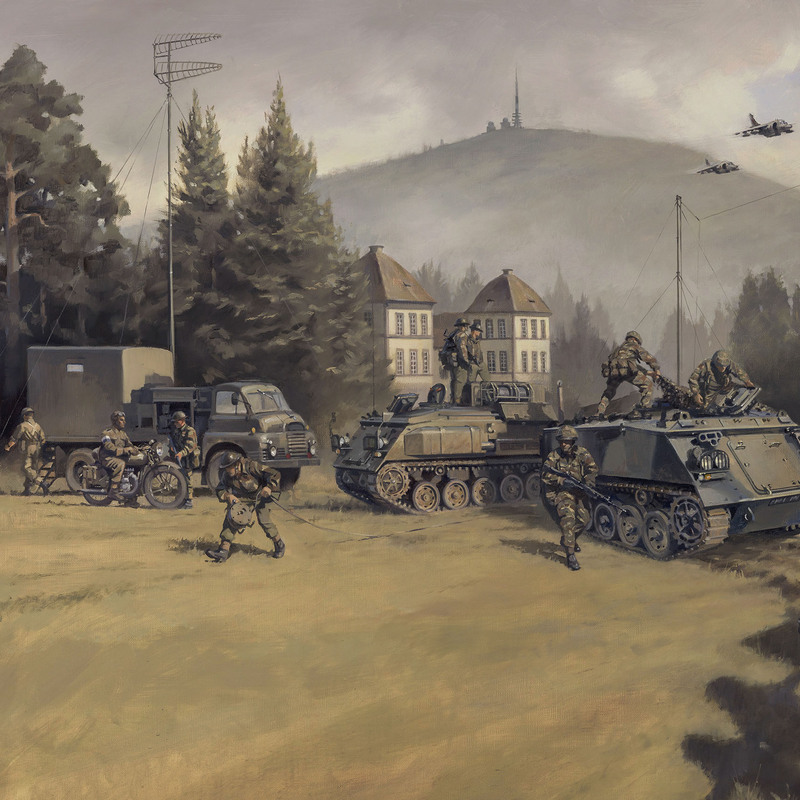 Representing various periods and significant landmarks of the Royal Corps of Signals’ presence in BAOR, the painting covers the time from Bruin communications (with soldiers in 1950’s battle dress) through an armoured headquarters showing an AFV439 (with figures wearing 58 pattern webbing and carrying the SLR personal weapon), Bowman vehicles (with the foreground figures wearing CS95 and carrying original pattern SA80 rifles), a modern day operator on TacSat wearing Osprey body armour, and finally the modern day MAN truck with Falcon communications. 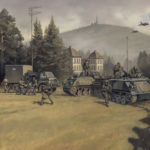 Landmarks include the former Soviet listening station on the Brocken, the Schloss at Bisperode, the focus of many exercises, and just visible through the trees is the Bismarckturm, named after the Iron Chancellor who played a key role in the development of modern Germany. 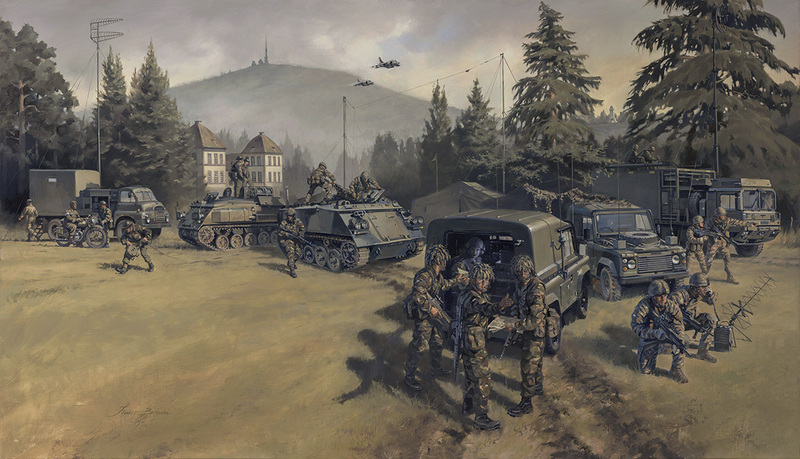 The progression of equipment and soldiers demonstrates the evolving role of the Corps, from NATO defence to Out of Area operations, and exemplifies the combination of the Corps ethos with the environment and soul of the German hosts across the decades – the Spirit of the Times, or in German, ‘Zeitgeist’.